WMV Converter helps to convert WMV or Windows Media Video to other audio or video formats like MP4, MP3, AVI, FLAC, OGG, M4A, MKV, FLV, 3GP, etc. Some of the listed free WMV converters help in converting other media formats to WMV format as well. These WMV converters are free to be used on Windows PC and do not need any kind of paid upgrades to convert files. There are some WMV converters in the list that come with exclusive features like audio cutter, video cutter, audio joiner, video joiner, media player, etc. Most of the listed converters are great batch WMV converters and can bulk process multiple files in single click. From the free software I tested, I liked Any Audio Converter for the wide range of import formats it allows to convert, Freemake Audio Converter as it is a simple and good WMV batch converter and Aura Video to Audio for a minimal design and interface to help user convert files and also it supports a good output format list. Also check out AIFF Converter, VOB Converter and MKV converters for Windows. Any Audio Converter can batch convert the added WMV and other media files in one click together. It is a free WMV converter with provision to change various settings to enhance quality of output file such as MPEG type, object type, encode, VBR quality, etc. The software has a media preview player on the right side of it. 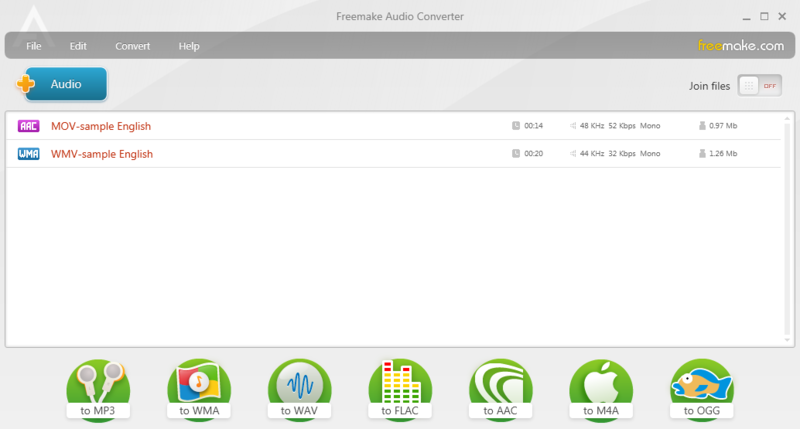 Freemake Audio Converter is a free WMV converter for converting media format files to supported output formats. It can batch convert the added files together. You can change settings like audio sample rate, audio channels, audio quality and bitrate for the output files. It comes with an inbuilt audio joiner to help you join all the added files as one output file. The supported output formats are FLAC, WMA, MP3, WAV, AAC, OGG, etc. Aura Video to Audio is a free software that helps in converting WMV files to supported output formats. These output formats include OGG, MP3, WMA, MPEG, FLAC, AAC, etc. It lets you change different advanced settings to enhance the output quality of the file like object type, encode, volume, VBR quality, audio quality, etc. ESFsoft Audio Converter is one more batch WMV converter in this list of free WMV converters. It can process multiple media files in one go easily. The supported audio formats in this software include MP3, AU, AIFF, FLAC, OGG, AC3, etc. There are no provisions to change any kind of setting for the output file. iWisoft Free Video Converter is a free software to help in converting added media files in single click. It is a simple free WMV batch converter. You can convert the files depending on the format type or device type that you wish the file to be played on or for. 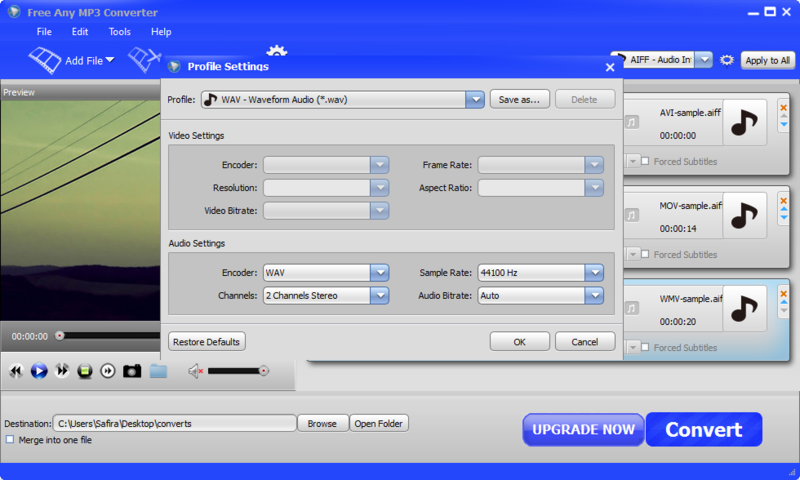 The software comes with an inbuilt media player to preview added files. 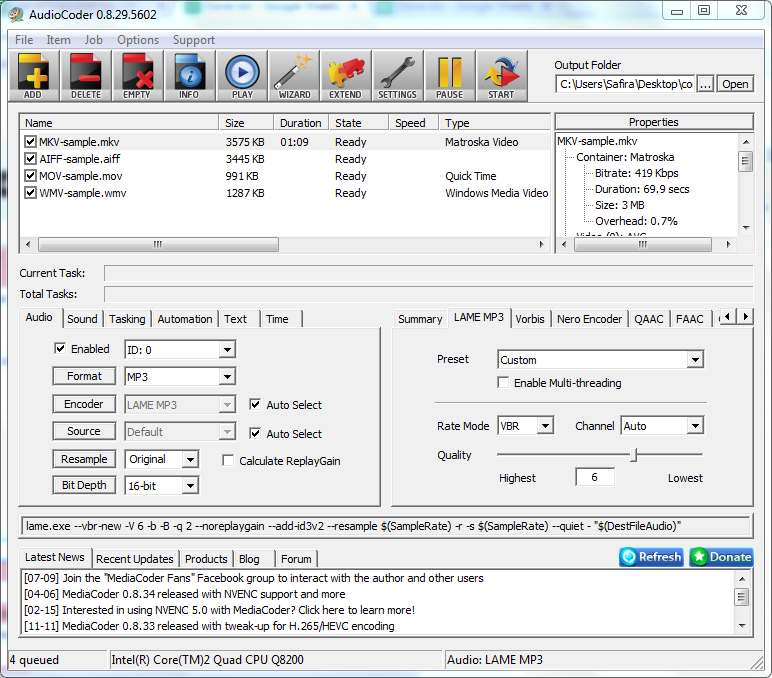 AudioCoder is a powerful WMV converter that can convert WMV format files to audio formats such as APE, DTS, MP3, WMA, FROG, OGG, PCM, FLAC, AMR, WAV, etc. With the help of this software you can change various settings like encoder, rate mode, tasking, text, time, automation, audio, bit depth and more. 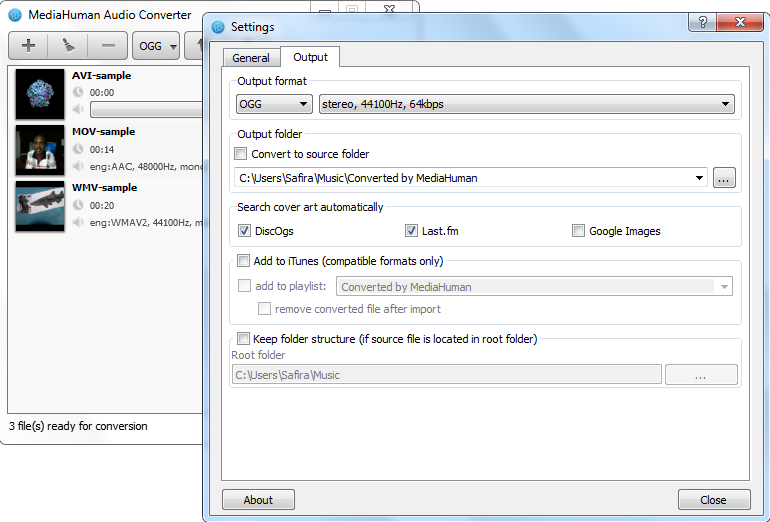 MediaHuman Audio Converter is a free software to convert WMV files to supported audio formats like MP3, OGG, FLAC, WMA, AIFF, AAC, etc. The software helps in converting multiple files at once because it is a free WMV batch converter. It can change advanced settings like channel, bitrate and sample rate. 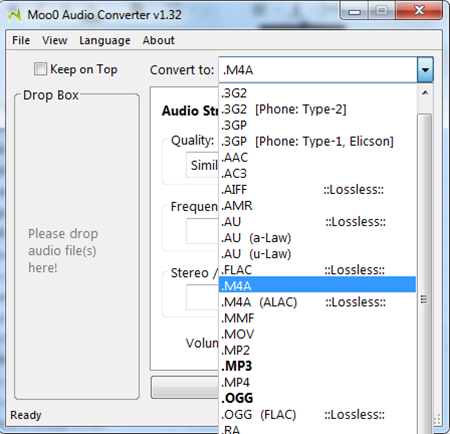 Moo0 Audio Converter is a minimal WMV converter for Windows PC. It supports changing output settings like volume, frequency, channels and quality. The software is a good WMV batch converter as it can process more than one file in one go. 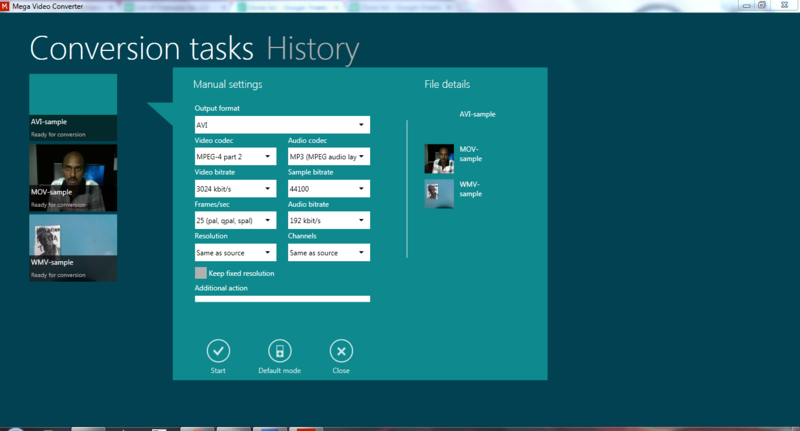 You can drag and drop the files into the software to convert. Free Any MP3 Converter can convert multiple format files to desired output format at once. It is a free WMV batch converter for Windows PC. There are settigns that you can change for output file like audio encoder, audio channels, frame ratio, aspect ratio, etc. There is a media player in the software that can preview the added files. 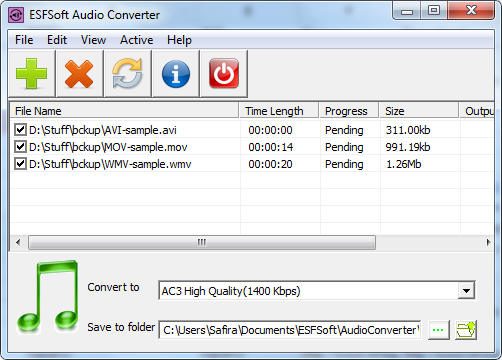 TAudioConverter Audio Converter helps in converting added media files in bulk as it is a free WMV batch converter. The software has audio and video trimmer to help cut the video or audio files. There are different settings that can change such as bitrate, encoding method, codec, bit depth, sampling rate, etc. The software is free for Windows PC. The software can convert WMV to MP3 without any problem. 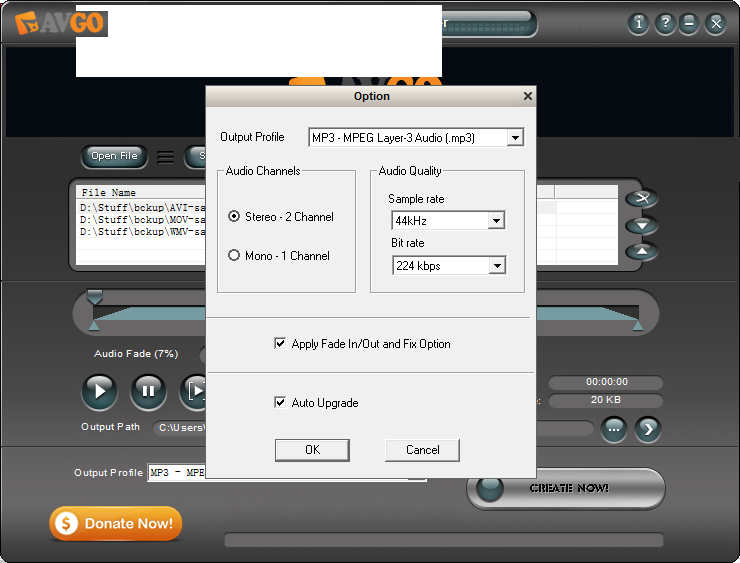 It lets you change settings like audio channel, bit rate, audio codec, sample rate, etc. The supported source formats include 3GP, MP4, MOV, FLV, FLIV, WMV, AVI, etc. The software supports only MP3 as the target format. 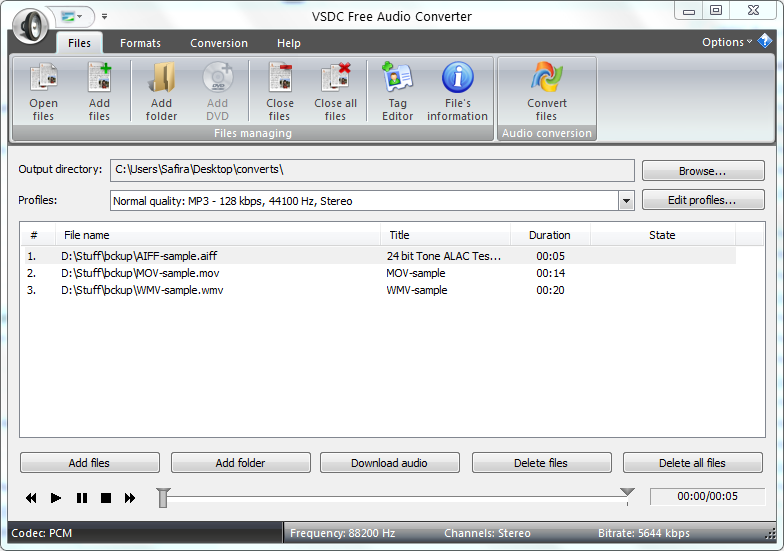 VSDC Free Audio Converter is one more WMV converter in this list that helps in converting WMV files to other supported formats. It supports output formats like MP3, WMA, OGG, FLAC, AAC, AMR, AU, etc. It also lets the user change or modify the output settings such as channels, audio profile count, audio codec, frequency and audio bitrate. It can convert multiple files to wmv format in single click as it is a batch WMV converter. 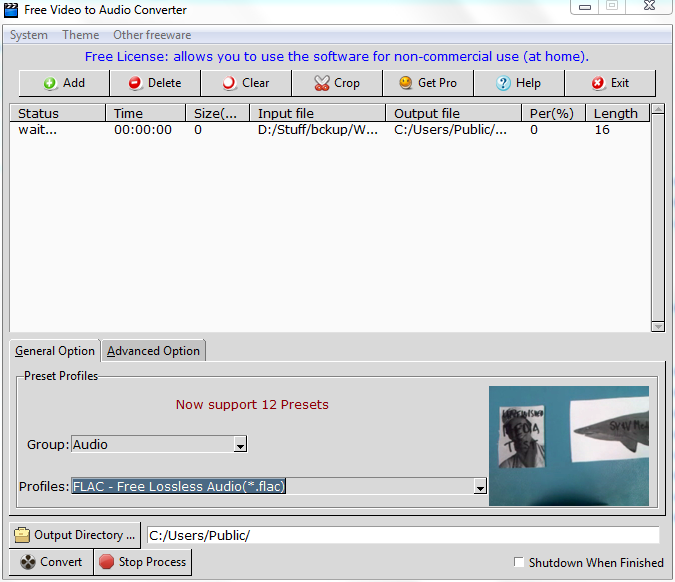 Video to Audio Converter Free Aunsoft is a free software for converting the added WMV to AAC, WMA, MP3, FLAC, WAV, OGG, AIFF, etc. There are different settings for the file which you can change such as audio codec, channels, bit rate and sample rate. It helps in batch conversion of files as well. 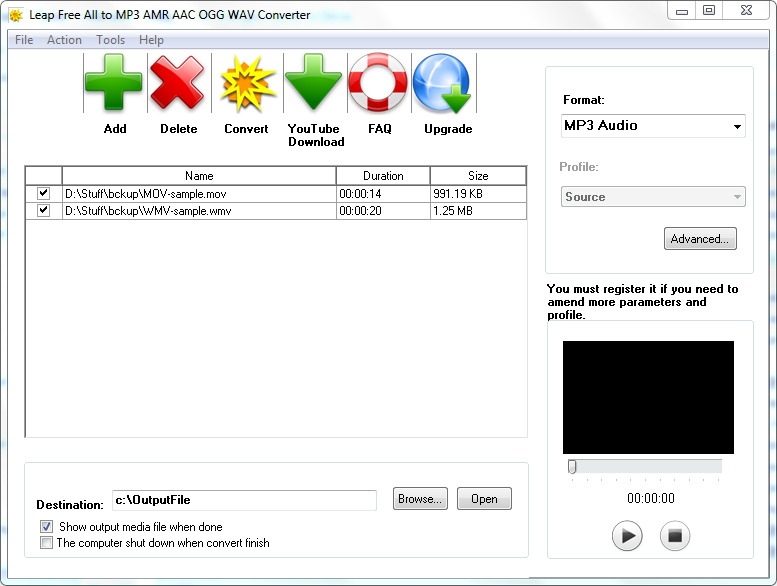 Free Convert AAC to MP3 AMR OGG M4A Converter helps in converting WMV files to formats like MP3, OGG, AMR, M4A, etc. The software has a small media player that can preview the added files in the software. To change the output file settings, you will have to purchase the paid version of the software. It works well as a batch WMV converter and can convert many files at once. Icecream Media Converter is a beautifully designed software for converting WMV files to other supported output formats. It is a free WMV batch converter that can process more than one file in single click. The software helps you convert files depending on the format or the device type. 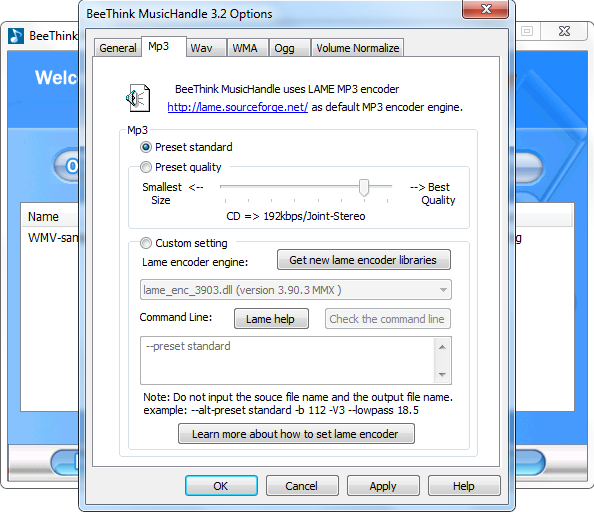 BeeThink MP3 WMA OGG WAV Converter helps in converting the added WMV files to the other formats like MP3, OGG, WAV, WMA, etc. The software lets the user change settings such as preset quality, preset standard, WMA codec, bitrate manager, etc. It is a good batch WMV converter to process multiple different files at once. 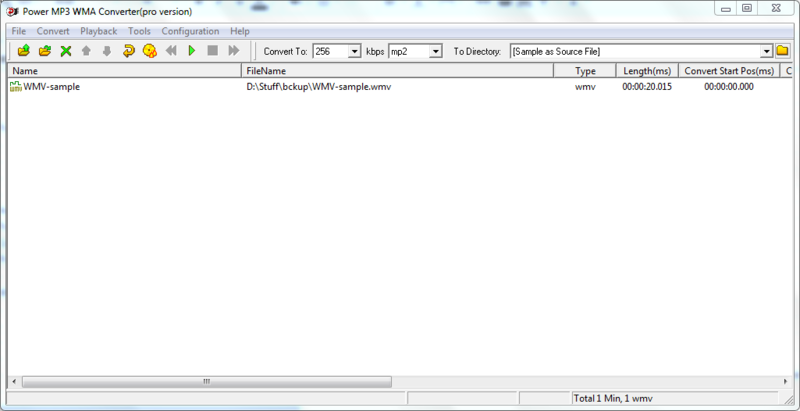 Power MP3 WMA Converter is another free WMV converter in the list with the provision to change the output file's tags. You can change various settings for the output file such as encoding method, VBR method, VBR bitrate, VBR quality, compress level, quality preset, etc. The settings depend on the output format you are converting the added files to. 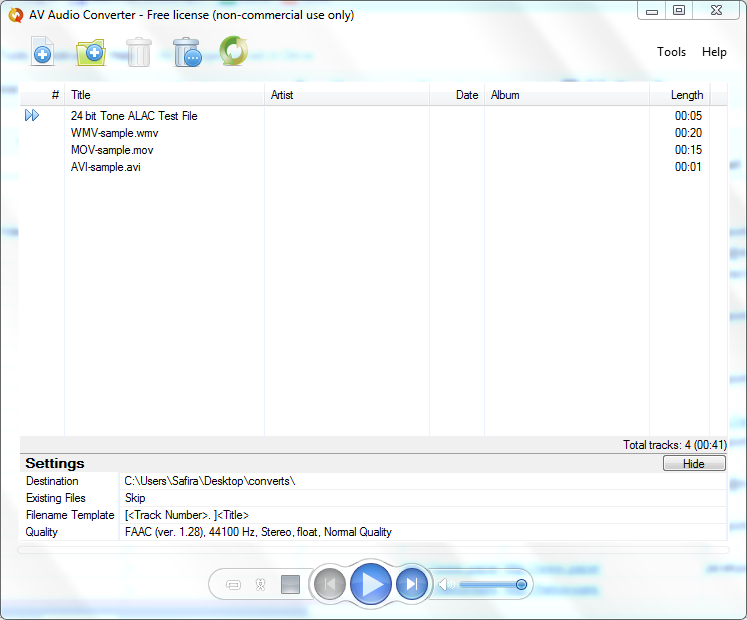 Free Music Converter is a free batch WMV converter for Windows to process multiple different files at once. The software helps in changing advanced settings like sample rate, encoderm channels and bit rate to enhance the output quality. It is a simple WMV converter with easy method of converting audio or video files. This software helps in converting popular video format files to the supported audio formats. 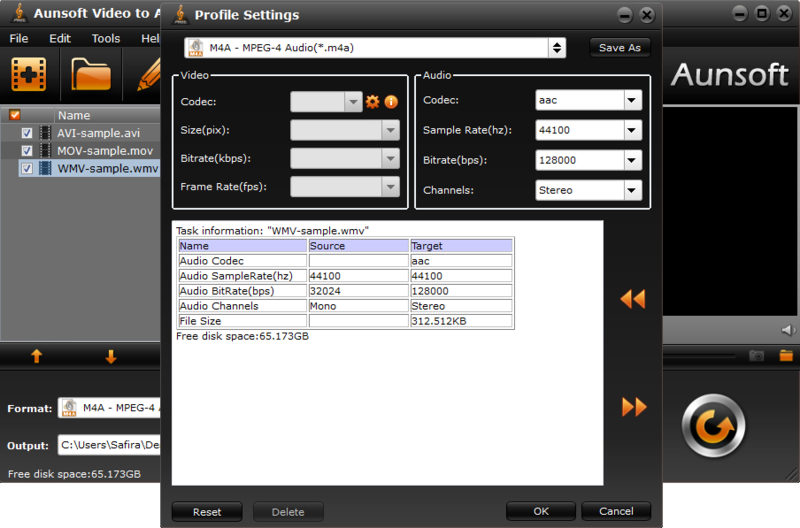 The supported input formats include 3GP, NSV, MP4, AVI, MOV, MKV, WMA, FLV, ASF, etc. The software helps you change different settings for output file like audio sample, audio codec, channels and audio quality. The software has an inbuilt cropping tool to help trim or crop added file. AVM Converter is a free converter to convert WMV files to other supported formats. It does not let you change any type of advanced settings for the output file. You can convert different audio or video files in single click with this batch WMV converter on your Windows PC. 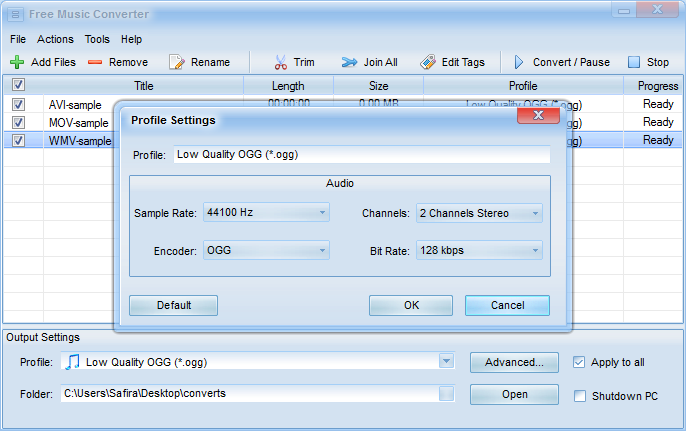 Leap Free All to MP3 AMR AAC OGG WAV Converter is another WMV converter available for free for Windows PC. It helps in converting added files to audio formats like AC3, AAC, OGG, AMR, WAV, MP3, etc. You can specify the audio quality you want for the audio file. It is a batch WMV converter and can conert different files at once. Oxelon Media Converter is a nice WMV converter for Windows PC. The software helps the users in converting the media files to supported output formats like WAV, RAW, RM, MP3, OGG, VOC, etc. It helps you change various settings like audio channels, audio samping rate; video settings like frames per second, video resolution, etc. You can batch convert added files in single go in this software. 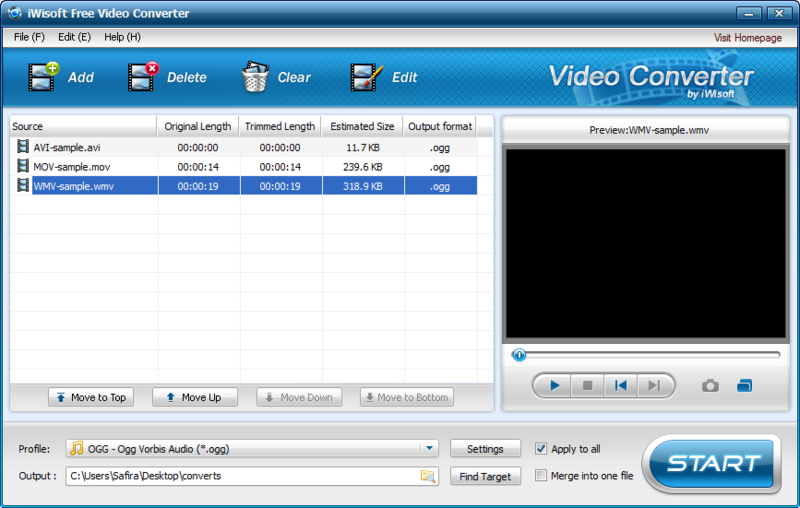 Mega Video Converter is another WMV batch converter in this list and can bulk process the added files easily. The supported output formats by Mega Video Converter are MOV, WMV, M4R, MP4, FLAC, MP3, 3GP, etc. With this software you can change settings like bitrate, resolution, channels, sample bitrate, etc. IQmango Converter is another free WMV converter which supports converting added files to formats like MP3, OGG, FLAC, AMR, AIFF, M3A, etc. It is a batch WMV converter and is capable of bulk processing more than one file at once. There are no advanced settings that can be changed for the output file. 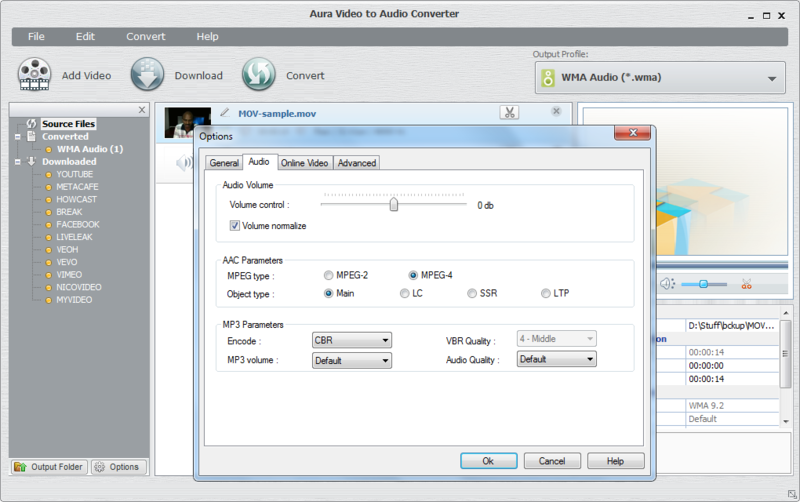 AV Audio converter is one more WMV converter in the list that can convert multiple files at once. It is a free batch WMV converter for Windows PC. The users can change different settings such as codec, sample rate, bits per sample, etc., for the output file. 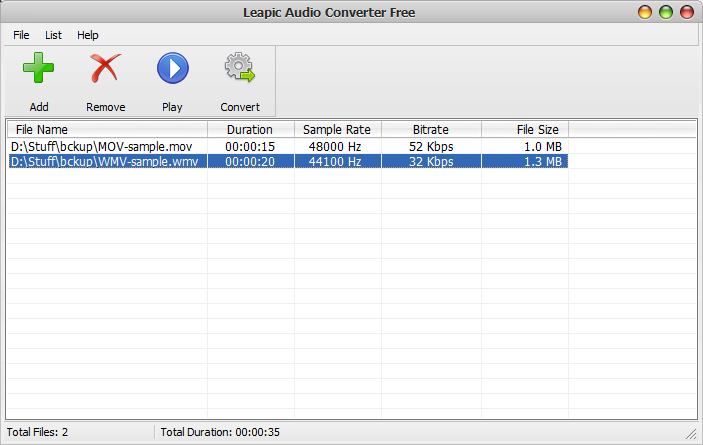 Leapic Audio Converter Free is a simple WMV batch converter developed for Windows PC. You can convert different multiple file types in this software in one click. You can mention output format and output audio quality with this software for the final file. Eusing Free Video Converter is a free WMV batch converter to process multiple files in one go. The software supports many output formats like 3GP, AIFF, MOV, OGG, FLAC, FLV, AVI, MP4, MP3, WMV, SWF and more. It can easily convert audio and video formats to supported output formats. RZ MP3 Converter helps in converting WMV files to supported output format MP3. In the software, there are no provisions to change any settings for the output file. It is a free WMV converter for your Windows PC. The software has inbuilt audio cutter with which you can trim or cut the audio or video files. Audio Extractor for Free is another free WMV converter that is simple and easy to be used on Windows PC. The software comes with a feature to clip or trim the added files. 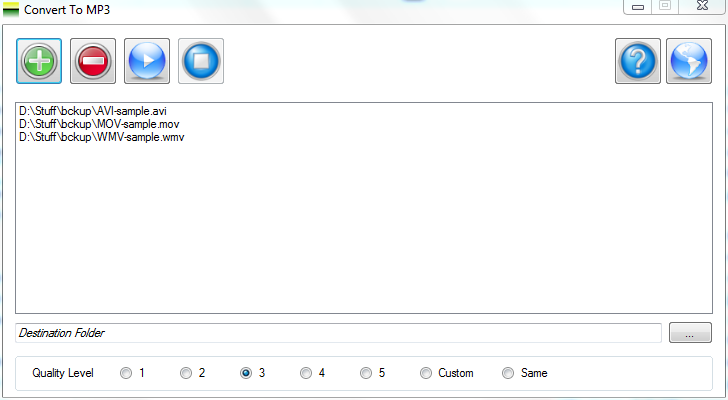 It gives users the liberty to change different settings such as sample rate, audio volume, audio channel, bit rate, etc. It supports output formats like MP3, FLAC, OGG, AU, WAV, WMA, etc. MediaCoder is a complete and powerful WMV converter for windows. It provides a wide range of settings that can be changed for the output file. These settings include preview, picture, sound, tasking, time, subtitle, AviSynth, video, audio, container, demuxer and streaming. The software can easily process multiple files in one click. Convert WMV file formats to other audio file types on your Windows PC for free with Avgo Free Audio Converter. The supported audio formats for output include WMA, MP3,M4A, MKA, MP2, WMA, RA, AU, AAC and AC3. It can batch process all the files in single click. You can change settings like audio channels, audio sample rate, audio quality and bit rate. 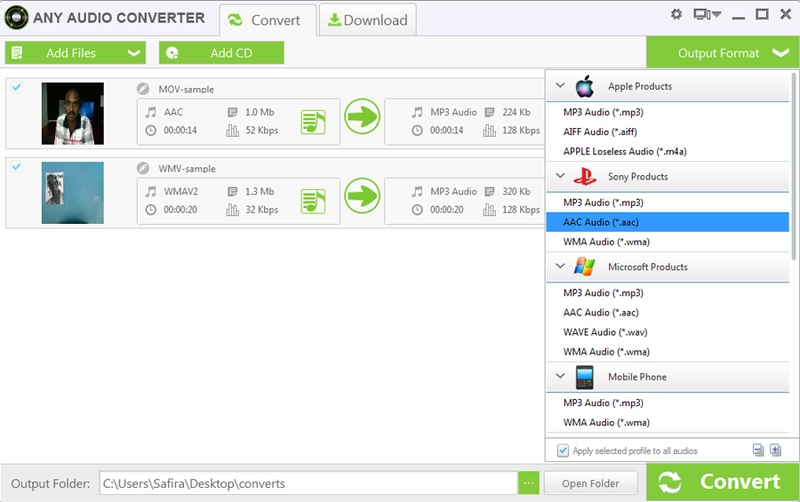 Convert To MP3 is a minimal and free WMV to MP3 converter for Windows PC. It does not support changing many output settings but lets you specify the bit rate for the audio. The software only supports converting WMV files to MP3 as it does not support other audio or video formats as target formats. Free Video Audio Converter can add WMV file to convert to audio formats easily by just defining the output or destination folder for the output file. The software does not support many output formats but it supports the common formats such as MP3, AAC, AVI, 3GP, etc. It does not allow batch conversion also.